Selecting the right parameters for your Precision & Ultra Thin Diamond Blade can be a very time consuming, trial & error frustrating process. The guide below has been designed to help you better understand the most important diamond blade variables, which will play a major role in performance, cutting speed, and surface finish of your Precision Diamond Blade. Selecting the Right Diamond Blade for your specific Material / Application will also minimize the secondary operations that may be required afterwards such as lapping, grinding, & polishing. The following are some factors to consider when selecting the right diamond blade for your application. The ever increasing variety of ultra hard, new generation, composite, engineered, highly metallic content and exotic materials, transform the way we look at Diamond Blades for Slicing, Dicing, Wafering, Cut-off, Singulation, Grooving, Slotting, Cross Sectioning, Gang Sawing, Slabbing, Rough Cutting applications. And set many age old conventional diamond blade technologies, equipment and diamond cutting methods obsolete. New materials require different diamond blades & technology. Materials you are planning to cut will have a large impact in the types of diamond blades you can use. If you are cutting hard alumina or sapphire, it is generally recommended that you use a soft bond, thin kerf diamond blades. However, if you are cutting abrasive materials such as sandstone or flagstone, a hard bond, thicker diamond blades may be a better solution. a.) 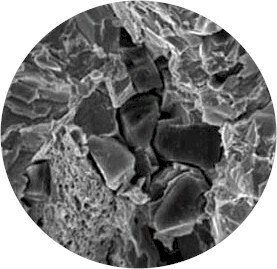 Hardness of Material – harder materials such as sapphire and alumina will require a softer Diamond Blade Bond. As a rule of thumb harder materials require softer bond, to cut faster and freer. While softer and abrasive materials require a harder bond, to last longer. 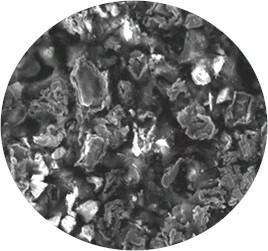 Material Hardness is defined as the materials capability to resist deformation. All materials are classified by their scale of hardness. Material hardness is measured by many different hardness scales such as Mohs, Vickers, Knoop and other scales of hardness. Further information on determining and understanding hardness of your material is available in this article below. b.) Material Cost - if the material you are cutting is precious, valuable, or expensive. The diamond blade cost will play a minor role in your cutting operation. It is suggested that you obtain a thin kerf diamond blade to minimize material loss and chipping. It’s always a good idea to have some type of an estimate of target cost and quality per cut. c.) Material Thickness – the thicker the material you are planning to cut, the greater amount of coolant and water pressure is required. d.) Material Geometry & Density - Each material has different density, hardness, composition. For this reason a diamond blades and technological processes that may work on one material/application, may not work on another. 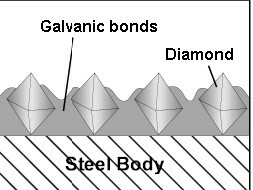 To obtain optimum results, each diamond blade should be ideally made to factor in the unique differences and properties of each material. Shape, Size, Diameter, Hardness, and Brittleness of your material. 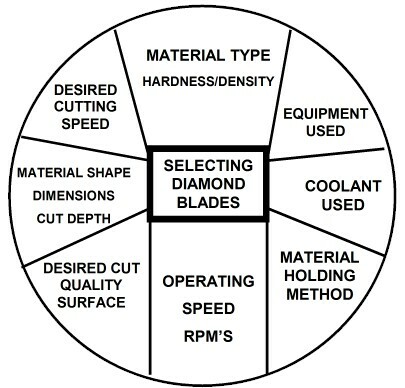 These variables will not only affect our diamond blade selection, but your choice material holding / fixturing methods, cutting equipment, speeds & feeds you can use. Most Precision & Ultra Thin Diamond Blades are used on computer/cnc controlled precision cutting equipment. Equipment used by Manufacturing and Research & Development facilities is usually different. 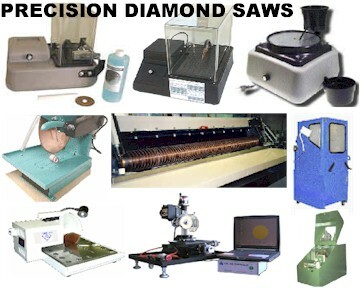 Precision Diamond Sawing equipment used by Manufacturing facilities world wide varies with industry used in, material dimensions, & materials machined. Semiconductor manufactures (chip makers) favoring dicing saws that are equipped with high speed air spindles capable of reaching up to 35,000 RPM. Precision Gang saws are used in high production scenarios of semiconductor packages (singulation), slicing of ultra hard & brittle materials, optics, as well as glass & quartz tubing, rods and many other materials. Smaller ultra hard, brittle material, and optics manufacturing operations use surface grinders for slicing, grooving, & slotting large variety of materials. The first stage of sample preparation, metallography, and failure analysis process. A failed part or piece of material is cut off to be studies and observed in order to identify the origin and reason of part/material failure. The main objective is to cause as minimum material deformation to sample as possible and not alter material structure while cutting. Another important consideration is to minimize additional steps required for sample preparation process. Depending on the type of failure, it may be necessary to take several specimens from the area of failure and from adjacent areas. Multi-Blade cutting system makes all cuts simultaneously and automatically separates end cuts from finished pieces. Gang saws are capable of cutting tubes, rods, and flat glass, quartz, carbon, ceramics, plastics, fiber glass, hybrid and exotic materials and most metals. Normal length tolerance is +/- .002". Squareness is +/- 1.0 degrees. Offering Speed, Precision, & Cost Savings. Designed for machining materials such as Glass, Quartz, Ceramics, and Metals. Cut 10 times faster over conventional sawing methods. Gang saws can cut 400 to 6,000 parts per minute 40/1000 to 59 parts in length, Precision Tolerances + 1/200. Ultra Thin & High Precision Diamond Blades are used everyday in thousands industries & operations to manufacture products that play an important role in our everyday lives. Typical Manufacturing Operations used diamond blades for Slicing, Dicing, Wafering, Cut-off, Singulation, Grooving, Slotting, Gang Sawing, Slabbing, Rough Cutting. On a full variety of advanced, non-ferrous and ferrous materials, ultra hard materials, precision optics, semiconductors and electronic components, which can be found in: PCs, cellular phones, DVD players, digital cameras, home video game systems etc. that play an important role in our modern every day lives. Diamond Blade & technical requirements are diverse as the manufacturing operations that use them. Typically manufacturing engineers, technicians & machinists demand a high level of consistency, accuracy, yield (output per cost), increased production rates, surface finish quality, & reduced material loss. What is common about these applications is the Diamond Blade will be used every day or several times a day, cutting several thousand parts or until the blade is warn out and replaced. Metal Bond (Sintered) diamond blades are usually recommended for this type of heavy duty use. However, if you have a very fine or specific finish requirement and do not polish material after cutting. HYBRID Bond diamond blades may be the best solution for your application. UKAM Industrial Superhard Tools has the Experience & Solutions to help you resolve even the most complex manufacturing challenges. Discover why thousands of advanced, ultra hard and brittle material, optics, semiconductor, composite, glass, stone, & jewelry manufacturing facilities around the world turn to UKAM Industrial Superhard Tools to optimize their diamond sawing & machining operation to ultimate level of efficiency. Diamond Blade requirements in Research are diverse as fields and researchers that used them. Most researchers & application engineers are primarily concerned about preserving material true micro structure and introducing least amount of damage & deformation possible to material / sample being worked on. Research Applications range from materials sciences, metallogrpahy, advanced materials, advanced/technical ceramics, optics, sample preparation, composites to new and breakthrough fields such as MEMS, Biotechnology and Nano Technology. Typical Research diamond blade users include Universities, Government or Commercial Laboratories, Military Research Facilities, Space & Science Organizations, as well as R & D departments of large organizations. Today, most laboratories and R & D facilities , work with dozens of materials. Frequently each material requires a different sectioning method and sample preparation approach. Selecting the right equipment, consumables, and parameters for your specific material/application will significantly affect your sectioning operation. UKAM Industrial Superhard Tools understands the challenges faced by faced by R & D Organizations and has developed diamond blades, equipment, accessories, and TOTAL SOLUTIONS to address most common R & D applications. We are constantly engaged in R & D and process development ourselves to keep up with increasing demands of the complex / advanced material world / community. d.) Chipping/Finish Requirements – if you have an application where surface finish and chipping is a critical factor, a sintered (metal bond) diamond blades with a very fine diamond grit may be the best solution. HYBRID Bond diamond blades is another alternative. e.) Tolerances – if you are using diamond blades for slotting or grooving or your material/product requires specific tolerances, you will need a custom diamond blade specifically designed for your application. f.) Material Cost – if the material you are cutting cut precious, valuable, or expensive. The diamond blade cost will play a minor role in your cutting operation. It is suggested that you obtain a thin kerf diamond blade to minimize material loss and deformation. It’s always a good idea to have some type of an estimate of target cost and quality per cut. Your capability to use coolant while cutting, will seriously effect your diamond blade selection. Most precision & ultra thin diamond blades in precision diamond sawing operations must be used with coolant. Shorter cutting life, material and cut deformation will result when using blades dry. 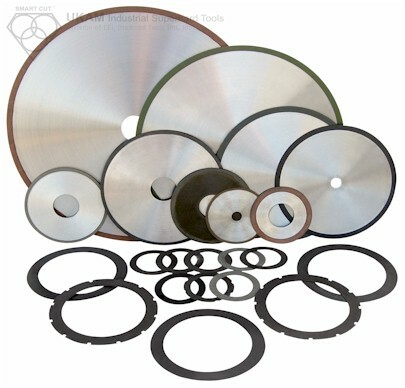 Electroplated (nickel bonded) diamond blades with coarse mesh size of diamond and some Resin Bond Blades may be used dry (without water) depending on the application (material being cut). 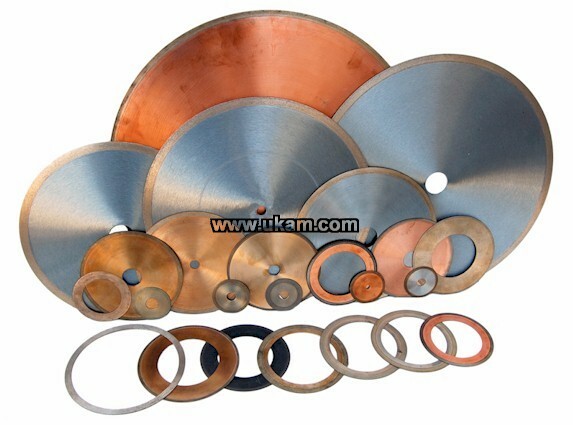 UKAM Industrial Superhard Tools does have the capability to manufactured diamond blades to be used without coolant. However, using diamond blades dry is not recommended on most applications. When chance prevails, use all diamond blades with coolant. Synthetic (Men Made) Diamonds - Most frequently used for most diamond blade manufacturing including sintered (metal bond), resin bond, electroplating (nickel bond). Synthetic diamond is more consistent in particle shape, hardness, and density. Synthetic diamond has replaced natural diamond in most applications because of this ability to tailor-make the diamond for the specific application. DIAMOND GRIT SIZE (Mesh Size) – grit size (mesh size) is generally selected depending on the speed you wish to operate the cut and surface finish of your material. According to U.S. Standards, mesh designates the approximate number of sieve meshes per inch. High Mesh Sizes mean fine grits, and low numbers indicate coarse grits. Diamond Mesh Size plays a major role in determining the surface finish quality, smoothness, level of chipping you will obtain, and material microstructure damage you will obtain. Finer mesh size diamonds such as 220 and 320 grit are much smaller in size than coarser diamond particles. And will give you a very smooth surface finish, with minimal amount of chipping on edges. These mesh sizes are usually used for fine cutting of a full rage of materials such as: LiNbO3, YVO4, GaAs, and optical materials. Courser diamond particles such as 80 and 100 grit are much larger in diameter and are frequently used fast cutting / material removal on more harder materials such as silicon carbide, zirconia, Al2O3, stainless steels, and other advanced ceramics and high metallic content materials. Which do not require a very fine surface finish. A full range of diamond Mesh Sizes is utilized for precision diamond sawing operations ranging from as coarse as 60 mesh to as fine as 3 microns (5,000 mesh). The diamond mesh size in a cutting tool also directly relates to the number of crystals per carat and the free cutting capability of the diamond tool. The smaller the mesh size, the larger the diamond crystals, while larger mesh size means smaller diamond. A 30/40 Mesh blocky diamond has about 660 crystals per carat, while a 40/50 Mesh diamond will have 1,700 crystals per carat. Specifying the proper mesh size is the job of the diamond wheel manufacturer. Producing the right number of cutting points can maximize the life of the tool and minimize the machine power requirements. As an example, a diamond tool manufacturer may choose to use a finer mesh size to increase the number of cutting crystals on a low concentration tool, which improves tool life and power requirements. Diamond Concentration will play a major role in determining the life and cutting speed of your High Precision Diamond Blade. Higher diamond concentration is recommended and usually used for cutting softer and more abrasive types of materials. However, the trade off is significantly slower cutting speed. Low diamond concentration is recommended and widely used for cutting ultra hard and brittle materials. Diamond Concentration is usually determined by the the slowest cutting speed that is acceptable for a specific application. Optimum performance can be achieved when the diamond tool manufacturer utilizes their experience and analytical capabilities to balance diamond concentration and other factors to achieve optimum performance for the tool operator. UKAM Industrial Superhard Tools has the experience & applications laboratory to help you select all the right diamond blade variables for your unique application. Sots can be placed around the rim of a steel core in order to permit coolant circulation and chip clearance in the cut. This provides for an improved washing action of kef, reducing abrasive action of the slurry which is otherwise confined to the cutting edge area. Of even greater importance is the reduction of heat because an lager percentage of the coolant is carried to the point of contact. Excess heat will shorten the life of the blade and may cause permanent damage to the steel core or to the bonding of the blade. As a blade diameter and cutting depth increase, the advantage of segmented or slotted blades over continuous rim design is greatly increased. Closely Spaced Segments - on standard narrow slot cores. Spacing between segments is 1/16" or less. This design is specified where a smooth cut is essential as in cutting glazed tile, glass and ceramic materials. The cutting action will often be smoother than the continuous rim blade with the bonus of increase blade life. Standard Slot Blades - typically have 1/16" to 3/16" spacing between segments. This recommended for general purpose cutting on materials where chipping and a very smooth surface finish is not essential. This design will tend toward a freer, faster, cutting action and provide better circulation of coolant. Wide Slot Blades - typically have slot width 5/16" to 3/8" and segment spacing to 1/2" or more. This type provides maximum chip removal and coolant circulation and reduces further the contact area. This design is excellently suited to soft, loosely bonded, abrasive materials. It provides for and allows maximum feed rate. For more & help on selecting the right diamond blade for your application. Contact UKAM Industrial Superhard Tools Engineering Department at Phone: (661) 257-2288. The RPM’s of the machine spindle should be noted when selecting the right blade specification of your application. So that the blade will be tensioned to run at the operating speed. This will insure a true running blade. Adherence to recommended speed is very important. Improper blade speeds can be rectified in many cases with a pulley change or change in blade diameter. Blade specification can be modified to some degree is speed is not correct, however deviation from recommended SFM should be amended for maximum performance. Make sure the cutting machine you are using is designed or can be adapter to be used for your application. Many machines are designed for other diamond blade applications and may not be ideal for you to use. Ultra Thin & High Precison Diamond Blades can be used either at low or high speeds. There are advantages and disadvantages of each process. Diamond may break (fracture) at very high speeds, and fall out at very slow speeds. An optimum surface speed / RPM's must be selected to balance out the two disadvantages. Diamond Blade life will usually increase at slower cutting speeds. However the increase in labor costs, utilities costs, depreciation of equipment and other overhead expenses. Will usually offset the saving of diamond blade life and other consumables. Cutting Speed & Surface Finish Quality is often the most important consideration when selecting the right diamond blade for your application. The operator mush choose a balance between life of the blades and their cutting rate. Diamond has a higher impact strength than the material being machined. During the sawing operation, the diamond ruptures the material by impact. Each diamond is able to transfer the electrical power from your cutting machine, into momentum that breaks the material on nano / micro level. By increasing power on your saw, your diamond blade RPM's and surface speed will increase as well. Hence, each diamond will chip off a smaller amount of material, reducing its impact force on material being machined. And reducing cutting resistance. In theory, by increasing surface speed / RPM's, each diamond should receive a smaller impact force. However, because impact is supported by a smaller volume, the impact force with this low volume is actually increased. There is a higher probability that the diamond particles will break or shatter. Hence, cutting materials at very low surface speeds, creates a large impact force between diamond and material being machined. Although the diamond may not break, the risk that the diamond will be pulled out of diamond blade and causing premature failure of the blade increases. Diamond is the hardest material known to mankind. It can penetrate into any material. Brittle or Soft materials such as granite, advanced ceramics, and copper can be cut by diamond, without diamond particles being broken or exhibiting large pull out. However, when cutting very tough and dense materials such as cemented/tungsten carbide, the contact pressure of each diamond particle must be increased in order to allow diamond to penetrate being cut. The Hardness, Density, & Brittleness of the material being cut will determine whether the diamonds inside the diamond bond matrix need to be blocky and tough enough in order to break (rupture) material by brutal force or if they should be friable & flexible to penetrate the material by sharp points. The performance of a diamond blade for just about any application / material can be evaluated under various criteria. The importance of any criteria depends on your requirements. Break in time - A diamond blade requires time to break in, to produce relatively chip free performance. The period of time under which this occurs, separates one diamond blade from another. Frequency of Dressing - The less you have to dress your diamond blade, the better off you will be. A diamond blade is fundamentally a cutting tool consisting of bond and diamonds. Diamonds are the cutting tool and bond is the medium by which the system is regulated. In purchasing diamond blades, many customers are often concerned about diamond concentration as a dominant factor in pre determining a diamond blades basic value. Diamond concentration may be an important consideration in performance of diamond blades – but it is essential to understand the concentration is not by any means the sole criterion of diamond blade evaluation. Each diamond blade manufacturer has its own standard for relating diamond concentration to diamond content. In evaluating a diamond blades potential value to you it is important to take into account a variety of cutting variables – only one of which may be diamond content. Diamond blade cost is usually a minor factor in the grand picture. Whereas labor and overhead costs are more important factors in the total cost picture. Therefore it is important to select a diamond blade that can provide the most performance and productivity, not the lowest blade cost. This product should not be purchased on the basis of price or concentration only, but on the basis of cost per piece cut. Cost performance evaluation is your insurance policy protecting you against taking account of less than all of the variables. Sintered (Metal bonded) diamond blades diamonds sintered and multiple layers of diamonds impregnated inside the metal matrix. Diamonds are furnaces sintered in a matrix made of iron, cobalt, nickel, bronze, copper, tungsten, alloys of these powders or other metals in various combinations. 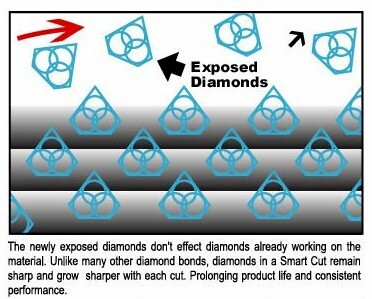 Metal Bonded Diamond Tools are “impregnated” with diamonds. 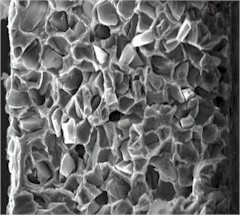 The compacted materials are then hot pressed or sintered to full density. Heating rate, applied pressure, sintering temperature and holding time, are all controlled according to the matrix composition. This means that selected diamonds are mixed and sintered with specific metal alloys to achieve the best cutting performance possible on any materials such as sapphire, advanced ceramics, optics, glass, granite, tile and etc. The metal bond surrounding the diamonds must wear away to continuously keep re-exposing the diamonds for the diamond tool to continue cutting. Sintered (metal bonded) diamond tools are recommended for machining hard materials from 45 to 75 on Rockwell Scale (5 to 9.5 on mohs scale of hardness). It is more wear resistant and holds diamond well in place, usually producing the highest yield/cutting ratio. As a general rule of thumb, Metal Bond (sintered) diamond blades longer than other diamond bond blades such as resin bond and electroplated (nickel bond) blades. They wear evenly, and are known for their long life & consistency. Sintered (metal bonded) diamond blades are the latest technology available in Diamond Blades. And represent the best value and performance per cut. Metal bond matrix does not protrude diamonds very high and hence usually requires lower cutting speeds than electroplated (nickel bond) and resin bond blades. Resin Bond Diamond Blades last less than Sintered (Metal Bond) diamond blades, but more than electroplated (nickel bond) diamond blades. Resin Bond is the softest of all the bonds, frequently used in applications that require a smooth surface finish and minimum amount of chipping. Made from a tough polymer formed to hold the diamond particles in the bond. A resin bond is really tar in a solid form. A resin bond must remain very fragile in order to expose new diamonds. For this reason, strong and high quality diamonds cannot be used in a resin bond. High quality diamonds are harder than a resin bond matrix, and would soon disintegrate the bond that keeps them in place. The diamonds that are used in a resin bond are poor to medium quality. Most of them prematurely disintegrate or fall out of the bond, before they have a chance of being used. This brings about the need for frequent blade dressing, causing the cut to loose its roundness or form. Another disadvantage of Resin bond is its high wear rate, lack of stiffness, and thickness limitation. Resin bond can cut hard & brittle materials fast, but will provide much shorter life. Thinnest blades that can be produced in resin bond is .004". A more durable bond is sintered (metal bond). Electroplated Diamond Blades have a high diamond concentration and give a freer, faster cutting action with minimum heat generation. Diamonds stay on the surface of the cut allowing for fast material removal. Electroplated Diamond Blades last less than metal bond, resin bond, hybrid bond blades and are the least expensive diamond blades available. Perfect for smaller jobs and beginning cutting operations. Just about the only type of diamond blade that may be used dry (without coolant) in a few applications, excellent for cutting very soft, ductile, & gummy materials. Electroplated diamond blades are frequently used for dry cutting (when coolant cannot be used). Electroplated blades a particularly well suited for cutting thermosetting plastics, GRP, pre-sintered and pre-fired (green) materials, electro carbons, graphite, soft ferrites, farinaceous products, deep frozen fish, bones, pc boards, and etc.